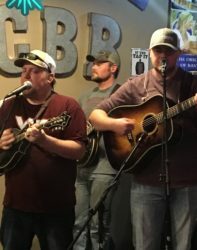 Upcoming Events, Happenings, and News at Creek Bottom Brewing! BOGO Pizza at Creek Bottom every Wednesday – both locations! 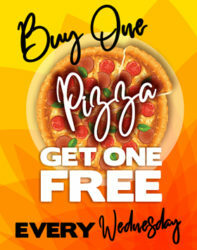 Buy a delectable sizzling brick oven pizza and get the second absolutely FREE! Dine in only, but of course you can take the second home! Pair this deal with our 50¢ boneless wings, 75¢ bone-in wings, $3 CBB Beer Happy Hour, and $2.50 domestics. Remember, 7 days without pizza makes one weak – bahaha! 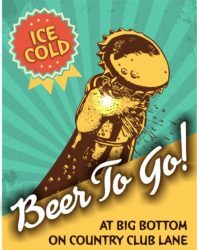 Growlers are back at Lil' Bottom!!!! Come check em' out! 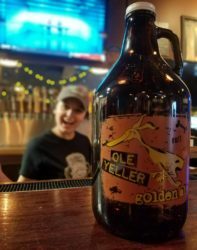 Customized with our famous Ole Yeller logo (CBB Golden Ale), make sure to fill one up to take home! To-Go Beer At Both Locations Now! The newest addition to Big Bottom is here!!! A to-go frosty beer cooler! 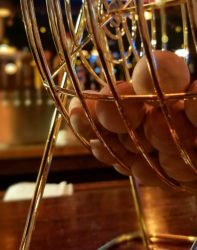 Choose from IPA's, pilsners, brown ales, sours, and MORE! Lil' Bottom has beefed up their stock of shelf and cooler beers as well. Come on in and check us out! 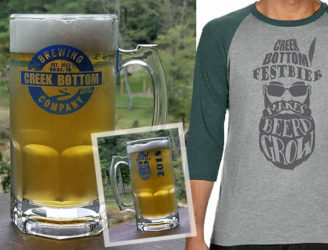 Limited Edition Stein Mugs, Raglan T-Shirts, and CBB FestBier! Prost! Celebrate Oktoberfest in style with our LIMITED EDITION 34 oz. glass CBB German Beer Stein and CBB Festbier Raglan T-Shirt. Both were created in honor of Creek Bottom Brewing’s first ever Festbier. We only have a few cases of these steins & a limited number of tees, so PRE-ORDER ONLINE STARTING SEPTEMBER 19! Pick them up at the Big Bottom Oktoberfest event this Saturday, Sept. 22 from 1-8 pm. Click read more to get to the purchasing link. New T-Shirts And Pint Glasses Are Here – Pure Hopulence! 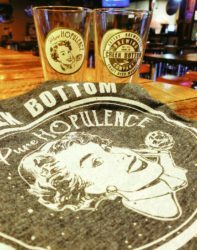 Pair our NEW Pure Hopulence T-shirts with our Creek Bottom special edition Pure Hopulence Pint Glass! Check out our colors and styles at either Creek Bottom location! Theyyyyyyy'rrrrrreee baaaaaaaccccckkkkk!!!!!!! 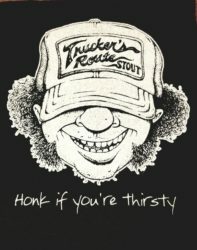 Trucker's Route Stout T-Shirts are here! Choose your color and style at either Creek Bottom Location today! 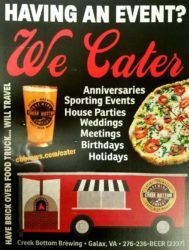 Creek Bottom can be the coolest caterer for your event with a wood fired oven and beer on our food truck! ORRRR rent out a catered spot at our restaurant location on Country Club Lane!